– Good value for money. – No third row seating. – Mushy brake pedal feel. – No V8 engine option. – Expect a few under-warranty repairs. 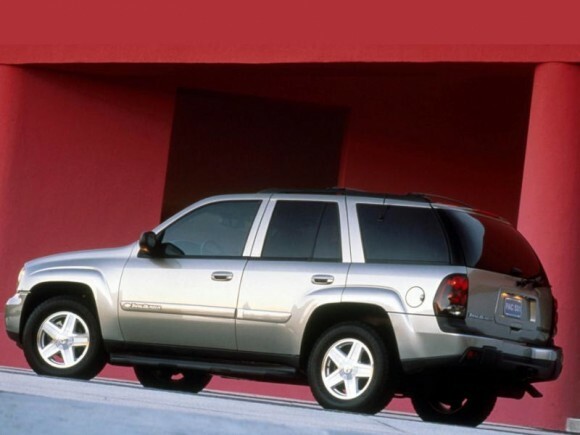 The versatile Chevy TrailBlazer for 2004 can easily strike a balance between active everyday life and a desire to take advantage of all life has to offer. TrailBlazer offer an unequaled combination of strength, power and high-tech precision, wrapped in a design that evokes patented Chevy Truck toughness and dependability. The Chevrolet TrailBlazer, in both 2WD and 4WD, has become a sales leader in the U.S. mid-size SUV segment. TrailBlazer EXT, with its spacious third-row seat, handles seating for seven people – with added cargo space behind the third seat. Rugged yet refined, The North Face Edition offers a lengthy list of useful features for outdoor enthusiasts. All-new features on the 2004 TrailBlazer include a last-door locking feature and new 17-inch bright aluminum wheels on TrailBlazer. Both Continental and B.F. Goodrich tires will be utilized in 2004. Interior design changes include an attractive and durable monochromatic instrument panel, Light Cashmere cloth reclining bucket seats or premium two-tone leather seating surfaces. Infotainment additions for 2004 include XM Satellite (continental U.S. only) and Navigation radios. The TrailBlazer doesn’t sacrifice refined ride and handling, ample cargo and passenger space, or long-lasting dependability. The TrailBlazer combines authentic Chevy Truck toughness and unprecedented precision. Hydroformed steel frame side rails form a strong foundation for the truck’s overall strength, optimum structural feel and ride quality. The frame’s torsional stiffness helps the performance of suspension components. The TrailBlazer’s five-link rear suspension combines with an independent, double-A-arm front suspension and hydraulic power-assist rack-and-pinion steering for superior responsiveness, quietness and performance. The heating/ventilation/air conditioning system (HVAC) in the TrailBlazer has been rated one of the best against “best-in-class” competitors, both car and truck. Its dual zones and high-airflow system warms up and cools down faster than virtually any other system in the segment or price range. For the first time, the TrailBlazer will offer optional brake and accelerator pedals that can be adjusted rearward in unison by nearly 3 inches for better positioning and comfort. The TrailBlazer driver information center has a 22-character message display, giving drivers feedback on dozens of vehicle systems and conditions. Some of the other available options on TrailBlazer include sun visors with lighted vanity mirrors, electrochromic inside rearview mirror with temperature gauge and compass, leather seating surfaces with eight-way power driver and passenger seats, and power lumbar, leather steering wheel and OnStar. The next-generation OnStar system provides hands-free calling, information services and many other features. New available infotainment features include XM Satellite Radio and Navigation Radio. XM Satellite Radio (continental U.S. only) provides 100 coast-to-coast, digital-quality channels of original music, news, sports and talk. Consumers can subscribe to the basic service for $9.99 a month – less than the cost of a single CD. In addition, GM customers with GMAC financing can choose to include the XM subscription in their car payments. Navigation Radio incorporates a dash-mounted GPS system and display with the vehicle’s sound system. The TrailBlazer in LT trim includes an overhead console with Universal Garage Transmitter and Travelnote. Universal Garage Transmitter allows vehicle owners to program up to three different signals for items such as the garage door opener, house lights or an electric gate. Travelnote can record brief reminders on a digital voice recorder. The TrailBlazer’s standard Vortec 4200 4.2L I-6 engine combines advanced technology with the proven balance of an inline-six engine to offer power and smoothness, and excellent fuel efficiency. The naturally balanced configuration virtually eliminates shake and idle roll. The standard Vortec 4200 engine delivers the most horsepower in its segment for strong trailer towing capacity. It meets or exceeds all sound requirements while providing outstanding 0-to-60-mph and 50-to-70-mph performance. The Vortec 4200 I-6 is mated to GM’s proven Hydra-Matic 4L60-E four-speed automatic transmission. The TrailBlazer offer excellent visibility and a commanding view of the road. The strong safety package includes standard four-wheel vented disc anti-lock brakes (ABS) as well as dual-stage air bags for front seating positions and three-point restraint systems for all seating positions (including the middle rear). Side-impact air bags for front seating positions are also available. And to help provide a smoother, quieter ride, an advanced system of 12 specially tuned body mounts uses hydraulics and rubber pads to isolate road inputs and noise, limiting vibration and harshness dramatically on any kind of road or trail. An Autotrac four-wheel-drive system is standard on 4×4 models. Traction control is available as an option for two-wheel-drive models. The North Face Edition package, available in both two- and four-wheel-drive TrailBlazer models, offers unique features that appeal to outdoor enthusiasts. The exterior features standard unique 17-inch sport aluminum wheels, lower accent-color body cladding, body-colored outside rearview mirrors, running lamps, headlamp washers and B-pillar badging. The interior offers unique leather accents and The North Face badged seats, mesh map pockets, rain-sense wipers, liftgate lighting, an underfloor storage cargo liner, heavy-duty floor/cargo mats, an adjustable cargo shelf with a table (EXT model only) and The North Face duffel bags and blanket. Several other features are required in order to get The North Face Edition package, including blackwall tires, skid plates (4WD models), locking rear differential and heated seats.